RAVENOL Precision Mechanics Oil is a multi-purpose, universal mechanics oil which is formulated to be resin and acid -free. 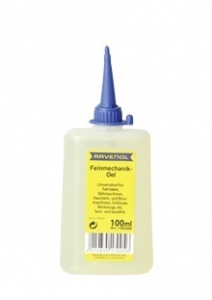 RAVENOL Precision Mechanics Oil can be used as a universal general purpose oil in the workshop and also around the home, for bicycle chains, sewing machines, household and office equipment, locks, hinges, tools, cars, motorcycles, DIY and anywhere else a multi-purpose oil is required. RAVENOL Precision Mechanics Oil is characterized by its light color, mild odor and a low sulphur content, making it pleasant in use. It is formulated to offer a long-lasting effect with little or no aging effect, and has a good viscosity-temperature behaviour making it suitable for use across a wide temperature range. Very effective handy oil .